Gilbert Keith Chesterton was born in London, England on the 29th of May, 1874. Though he considered himself a mere rollicking journalist, he was actually a prolific and gifted writer in virtually every area of literature. A man of strong opinions and enormously talented at defending them, his exuberant personality nevertheless allowed him to maintain warm friendships with people–such as George Bernard Shaw and H. G. Wells–with whom he vehemently disagreed. Chesterton had no difficulty standing up for what he believed. He was one of the few journalists to oppose the Boer War. His 1922 Eugenics and Other Evils attacked what was at that time the most progressive of all ideas, the idea that the human race could and should breed a superior version of itself. In the Nazi experience, history demonstrated the wisdom of his once reactionary views. His poetry runs the gamut from the comic The Logical Vegetarian to dark and serious ballads. Though not written for a scholarly audience, his biographies of authors and historical figures like Charles Dickens and St. Francis of Assisi often contain brilliant insights into their subjects. His Father Brown mystery stories, written between 1911 and 1936, are still being read and adapted for television. 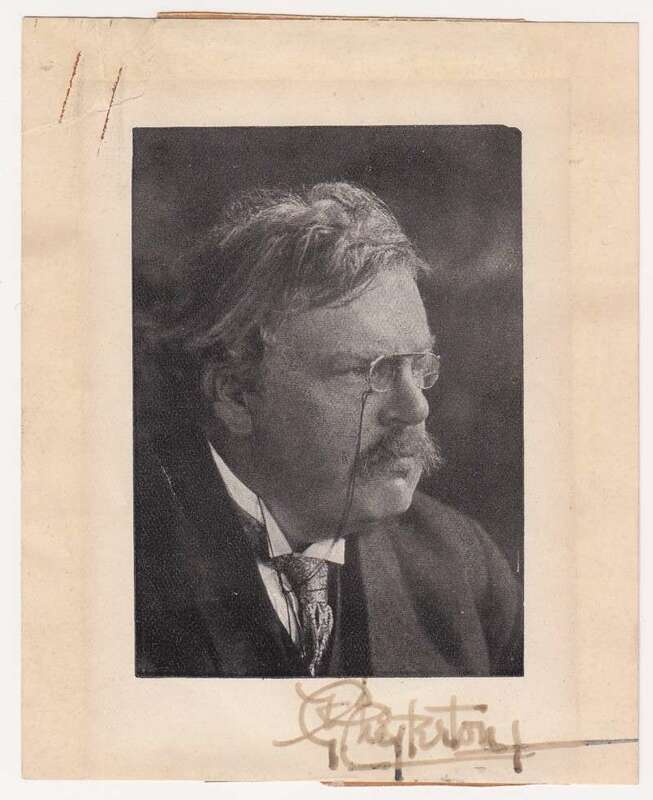 The Collection has two autographs of G. K. Chesterton, featured here. The first is a small autographed sketch of G. K. Chesterton. The second is his signature from an envelope. His politics fitted with his deep distrust of concentrated wealth and power of any sort. Along with his friend Hilaire Belloc and in books like the 1910 What’s Wrong with the World he advocated a view called Distributism that is best summed up by his expression that every man ought to be allowed to own three acres and a cow. Though not known as a political thinker, his political influence has circled the world. Some see in him the father of the small is beautiful movement and a newspaper article by him is credited with provoking Gandhi to seek a genuine nationalism for India. Orthodoxy belongs to yet another area of literature at which Chesterton excelled. A fun-loving and gregarious man, he was nevertheless troubled in his adolescence by thoughts of suicide. In Christianity he found the answers to the dilemmas and paradoxes he saw in life. Other books in that same series include his 1905 Heretics and its sequel Orthodoxy and his 1925 The Everlasting Man. 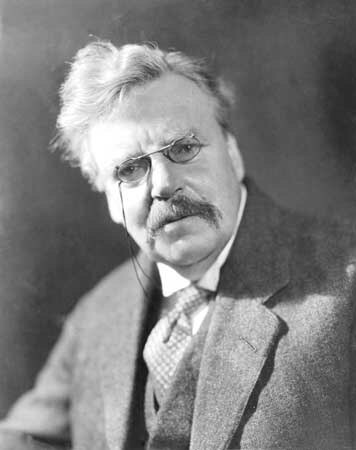 Chesterton died on the 14th of June, 1936 in Beaconsfield, Buckinghamshire. During his life he published sixty-nine books and at least another ten have been published after his death. Many of those books are still in print. Papal Artifacts gratefully acknowledge www.ccel.org, the Christian Classics Etheral Library for their generous use of this biographical information.